Pages 2-7: Background sketches of the mansion and the garden. 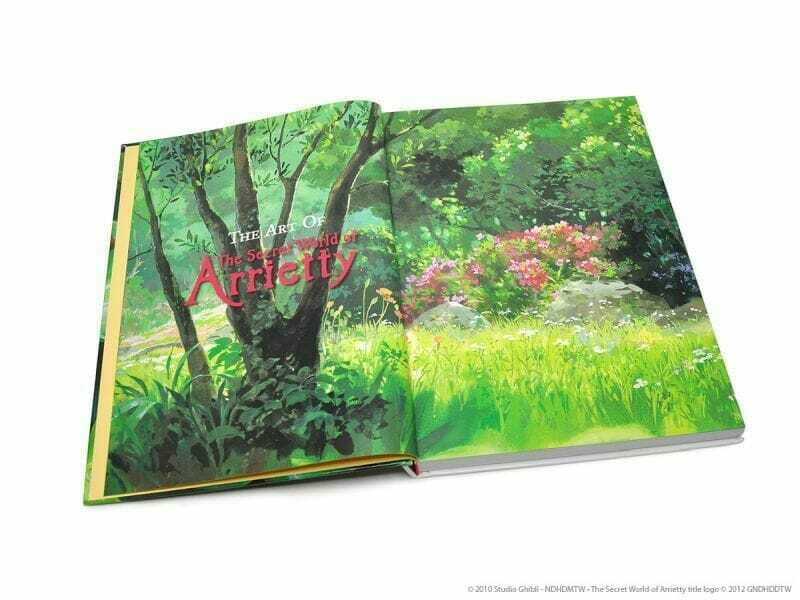 Pages 8-9: Here, we finally reach the introduction and the backstory about the making of The Secret World of Arrietty. According to the book, Miyazaki had been interested in is turning Mary Norton’s The Borrowers into a film for more than forty years. He wrote the screenplay and choose Hiromasa Yonebayashi as the director (in his debut). I love how Miyazaki didn’t ask Yonebayashi if he wanted to direct the movie. He told him and wouldn’t take “no” for an answer. Making a movie is hard work, and not giving up or backing down is an important skill. Also, in another light this can be viewed as bullying, but perhaps that too is an important skill when you’re trying to get a film made. It’s amazing how compartmentalized the process is. We see the finished product, but the people making it only see what they are directly working on. As for the sketches, we get to see a variety of takes on what was then an unfinished product. Arrietty Clock went through a variety of different looks. I enjoyed page 21 in particular, where we get to see the concept images of the family living together. The sense of scale was something the staff struggled to present, and here we get some of their first takes on it. 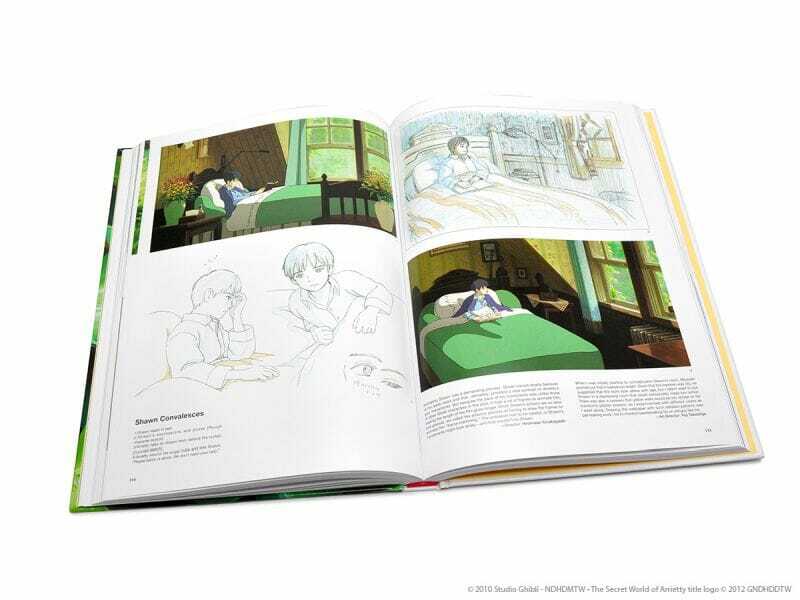 Pages 35-43: Hayao Miyazaki provides his thoughts on the story, as well as his concept sketches for The Secret World of Arrietty. You can see his thought process, as he figures out how to portray our world from the perspective of people who are smaller than an apple. Visions of the domestic life of our borrowers. Note that they had to build their own furniture, such as the chair we see in the lower image of page 38. Pages 44-57: The production sketches. We see the cat vs. crow fight on page 47, as well as a look at the world at large (and small). Pages 58-67: We see the opening sequence laid out, from the opening shot of the cityscape, to the roads Jessica drives out of the city to the isolated old mansion. In our first sense of perspective, we get Shawn’s view of the grand old tree on pages 64-65. We also see some of Shawn’s initial sketches and Director Yonebayashi’s thoughts on the development of the character throughout the process. 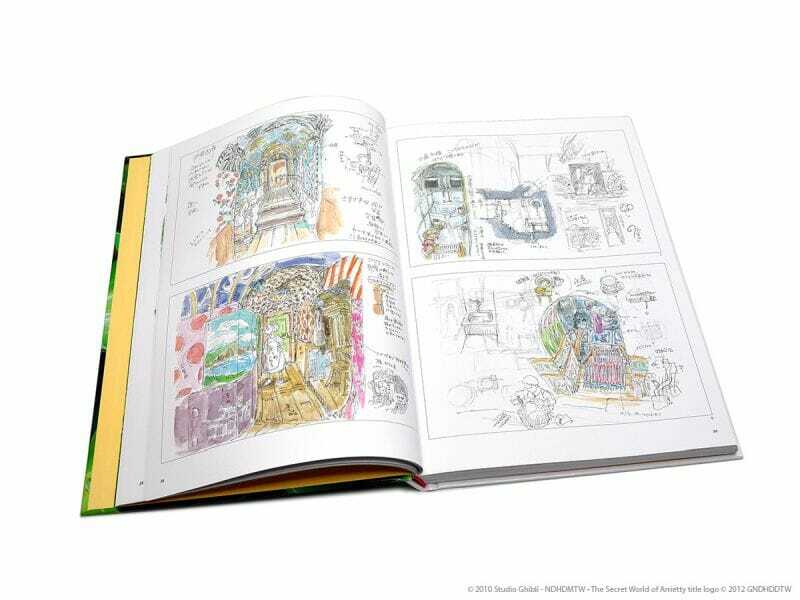 Here we see some photos of the outside world, sketches of Arrietty, and a series of looks as the vent that plays a major role in the film. This section closes with a sketch of the house under the floorboards. Here, we get a few pictures of Arrietty’s room. Page 110: A transportation system built off repurposed borrowed items. It’s a great image. Page 132: There’s something charming about seeing stamps on the wall as art. We get to see Shawn in various stages of production, but the key here is the quotes from Hiromasa Yonebayashi and Yoji Takeshige. Slow moving characters require a lot of frames of animation to move smoothly, and they have… thoughts on the subject. Takeshige uses the term “Backbreaking”. Page 152: The entrance to the mansion in the setting sun. If I were to frame an image from the book, this would be it. Pages 170-171: The garden in full bloom. Gorgeous. Pages 176-177: Arrietty and Shawn (or more specifically, Shawn’s hand). Pages 178-179: They weren’t kidding about going for sharp imagery. The bricks in the background are a nice touch. Page 192: A staring contest. Page 208: The theatrical poster. It’s also the image from the cover. Pages 209-242: Here, we have the script. It’s nice to be able to read through it. I should note, though, that unlike some other Ghibli productions, this one is very difficult to bring to life on stage as the differences in scale between the characters is tough to recreate. Pages 243-245: Finally, we close with the song lyrics. My guess is if your a fan of the film, you’ll already know most of them. 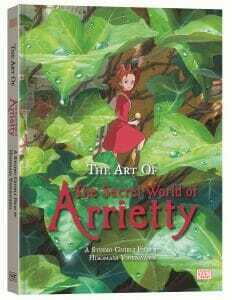 The Art of The Secret World of Arrietty has everything you could want from it. You get the backstory, the script, and concept sketches, and the scenery from the film. The production value of the Viz Media’s Ghibli art books is very high, and I highly recommend them if you want to learn more about the film, or just collect the art from it.